The Exquisite Full Bedroom Group by Signature Design by Ashley at Casa Leaders Inc. in the Wilmington, Long Beach, Torrance, Lakewood, Los Angeles area. Product availability may vary. Contact us for the most current availability on this product. Drawer/Shelf Construction The drawers are framed with a decorative emboss. Bed Storage Under bed storage or trundle panel available. Case Details Ample shape can be found throughout in the valances, crowns, base strips and more. 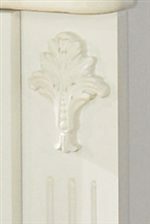 Appliqués and rosettes provide additional detail. The Exquisite collection is a great option if you are looking for Glam Traditional furniture in the Wilmington, Long Beach, Torrance, Lakewood, Los Angeles area. Browse other items in the Exquisite collection from Casa Leaders Inc. in the Wilmington, Long Beach, Torrance, Lakewood, Los Angeles area.